The HUMIDIFLOW® humidifies the dry oxygen breathed in by oxygen therapy patients. Developed with membrane technology as a practical alternative to common respiratory humidification systems, including the widely used bubblers, the HUMIDIFLOW humidifiers is easily installed, patient-friendly, silent in operation, and completely maintenance-free. 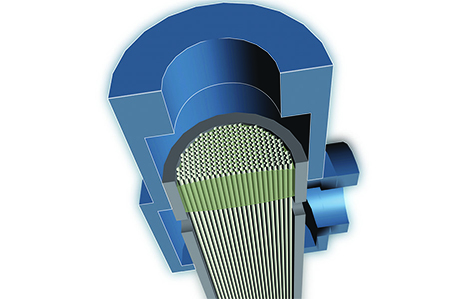 Cutaway illustration of Humidiflow's hollow fiber membranes. 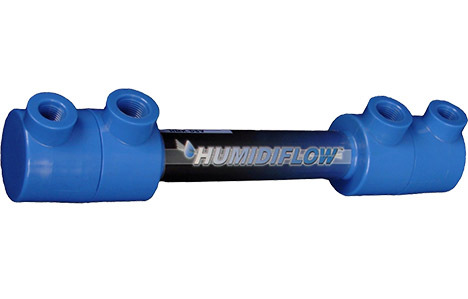 HUMIDIFLOW will continue to work silent and maintenance free during the lifetime of the equipment. Oxygen therapy is often prescribed for patients with COPD and other respiratory diseases. An unfortunate side effect of supplemental oxygen is that the dry air can lead to dry and irritated nasal passages, dry mouth, and chapped lips. As a result, humidification is often prescribed for patients receiving oxygen therapy. Unlike noisy bubblers that require frequent filling, cleaning, and ongoing maintenance, the HUMIDIFLOW humidifier takes moisture from the ambient air and transfers it directly to the oxygen stream, providing hassle-free patient comfort. In addition, the units can be fitted inside stationary units by manufacturers of respiratory units, HME dealers, doctors and respiratory therapists for a unique and sustainable value-add as compared to models that are not equipped with this solution. 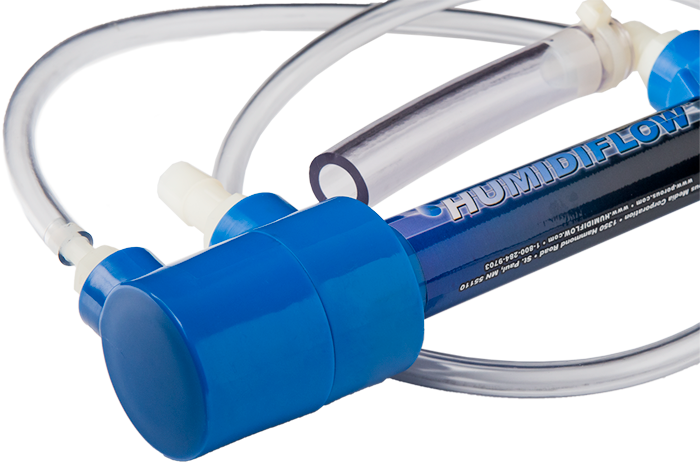 In a survey conducted with dealers across the country, approximately 63% of patients complaints received by dealers were due to cross-threading the humidification bottle to the cap. Approximately 21% of patient calls involved rain out in the lines. The Humidiflow’s advanced technology eliminates these challenges while providing reliable operation without interruption and without the need for service calls. Another advantage of the HUMIDIFLOW humidifier is its ability to be fitted inside of an oxygen concentrator. Once installed, the Humidiflow humidifiers operates effectively, reliably, and consistently – users may not ever realize that it is there. The ultimate solution for ease of use, This invisible solution operates siliently and has no moving parts to wear out. The Humidiflow can be installed on any brand of oxygen concentrator or customized for existing or new concentrator designs. Due to the high cost and ongoing support of humidification bottles, most dealers only supply humidification to patients who either have a doctor’s prescription, or who complain of symptoms that are commonly associated with dry oxygen use. As a result, only about 50% of patients actually have access to humidification – even though the negative effects of inadequate humidification are well known. With Humidiflow humidifiers, the ongoing costs are eliminated. The advanced hollow-fiber membranes developed by Pentair act as a moisture exchanger. The oxygen stream flows through the inside of the membranes, while ambient air -drawn in by the suction of the air compressor- flows in the opposite direction on the outside of the membrane. Moisture from the atmosphere diffuses across the membrane wall into the dry oxygen stream, humidifying the oxygen and allowing the patient to breathe comfortably.